Welcome to the 2010 edition of the Westerly Design Blog That’s Temporarily A Travel Blog Instead Of Horse Art News! Thanks so much for sticking around during the horsey-art hiatus. What an interesting first week of the new year. Paul still remains in New York looking after his dad’s affairs. We now know why tax attorneys and estate planners get the big bucks. Plowing through all the finances and getting his dad set up so he can live without having to deal with financial details is a slow and sometimes frustrating process for Paul. His mom handled all their money and investments over the years, and sadly we didn’t realize how much she was slipping in the last three, so the books were kind of a mess. Still hard to tell when Paul will rejoin me here in the UK, but I’m doing just fine on my own. 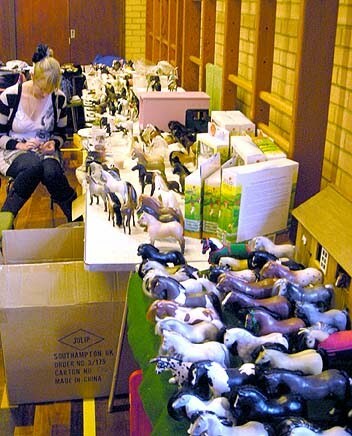 On the new year’s weekend, I piled the Boyz in the car and drove north to attend a little friendly get-together of UK people who collect model horses. 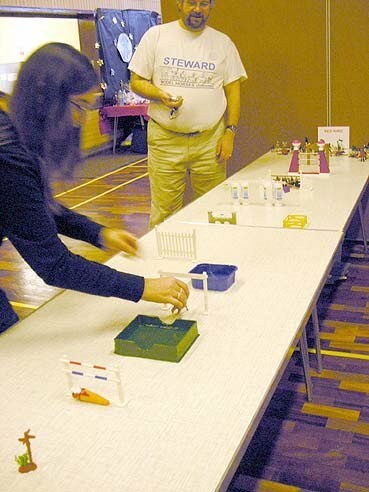 It was all for fun instead of the more usual competitive judged show. In fact almost all the horses there were the UK-based Julip brand, pretty much totally unfamiliar to those of us in the USA. 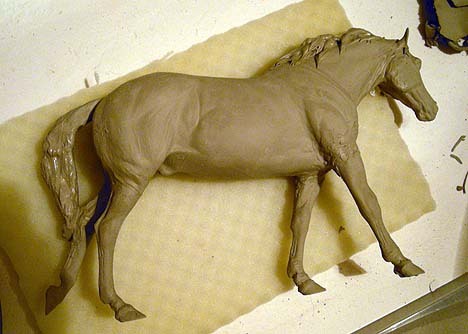 They are cute little rubbery, Gumby-like horse models with wire in the legs and hair manes and tails. Breyer has had a tough time getting their products into the UK, and I’m guessing Julips might be why. The horses are rather unrealistic examples of horses but they are cute, can be posed, probably cost less, and come in clever sets with all kinds of accessories. I really enjoyed the day, and competed in the highlight of the day, Show Jumping, and even won 3rd prize! 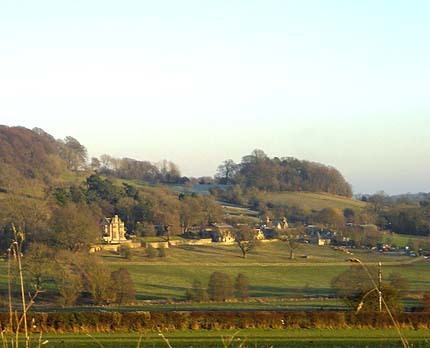 That night I drove over to spend two nights in the Cotswolds area of central England, home of the most perfect countryside and villages to be found, I think. 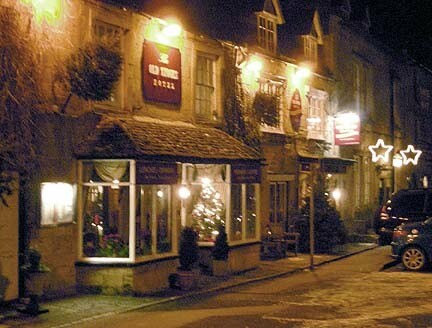 I had found a dog-friendly, wi-fi enabled old hotel in Stow-on-the-Wold’s main market square, called The Old Stocks. The town was still dressed in their holiday decorations and had a pretty dusting of snow when I got there about 6pm. I was given a cosy room that opened out to a little outdoor courtyard so the dogs could go right out. The place was almost completely empty two days after New Year’s Eve. I sat in front of a roaring fireplace in their homey lounge in order to use my laptop. They had a dusting of snow Saturday night and it’s been so cold it never melted, so most fields and paths still had a little covering of it. Plus they’ve been having hard frosts every night. The trees and grasses were coated with it in the morning, very pretty. 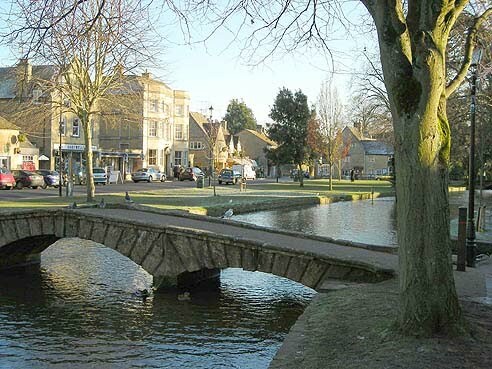 After that walk we got in the car and drove to two other classic Cotswolds towns (or tour-bus-magnets, if you are here in the summer). 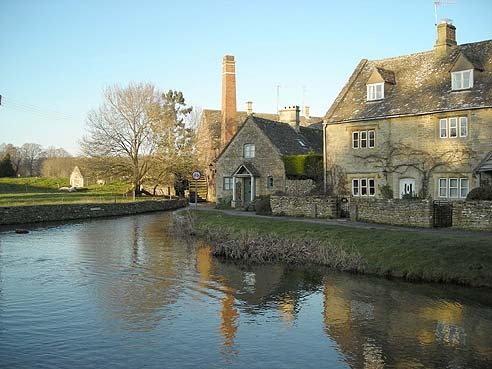 Upper and Lower Slaughter and Bourton-on-the-Water. The Slaughters look right out of a movie set; you can’t believe it is a real place. 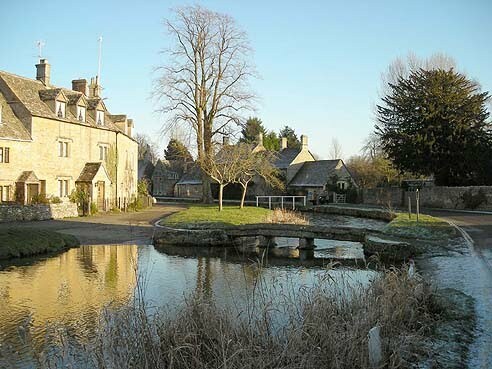 I realized later I could have walked to Lower Slaughter from Stow on the same path I was walking—it was only about 3.5 miles one way—but that would have been just a little too long on that cold morning. 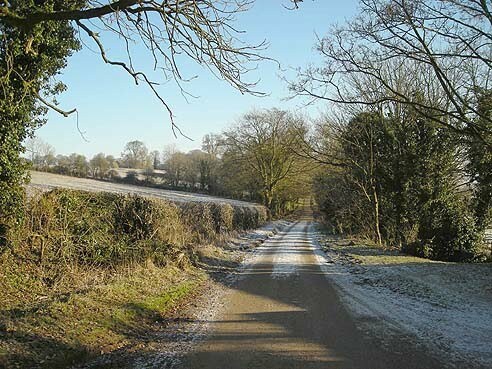 The cool thing about this area is that the main through road, the A429, is the ancient Fosse Way, an important Roman road running from the West Country to Lincolnshire in as straight a line as the terrain would allow. I think there is a place further south where you can actually walk the old road as a footpath, but most of it now is a regular car-road. It was still great to be on the same route the Romans built originally and everyone else used since. I drove home really early on Tuesday morning, because the forecast was for significant snow that night and I didn’t want to get caught in it in case it came early! I’m glad I did because we ended up getting about 7 inches in Maidenhead. Which is a big deal for the UK, who don’t usually get big snows and long periods of below-freezing cold. They were pretty much paralyzed all last week because of that! Consequently I have become among the shut-ins when I discovered that my fancy company-issued BMW station wagon is utterly useless in snow. Not only is it rear wheel drive, but the tires had no tread worth a darn. I pulled out of my teensy driveway and instantly got stuck halfway into my street, wheels just spinning. So much for the vaunted German Engineering, how I miss my trusty Subaru Outback right now! Happily after a few minutes of chipping away at the compacted snow with a pitch fork and push-broom (the only tools in the house), my lovely neighbors came to my rescue. Before long I had a team of about 10 people looking on and pushing/advising. The savior came in the form of neighbor Joe’s bag of SAND! Did the trick for traction in an instant. A bag of sand or even cat litter is like gold here right now. I have been without wheels since Tuesday but I can walk to two shops for basics. (Though not surprisingly, they were sold out of a lot of goods because a lot of people were staying home from work.) I can also take the bus into Maidenhead’s high street if needed. 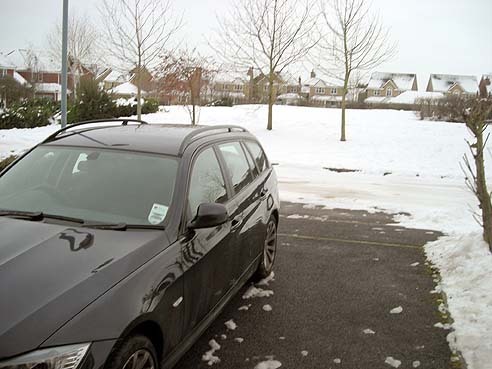 The offending vehicle and my (now cleared) driveway. The Home Counties don’t seem to have snowplows (I suspect the concept doesn’t exist in the UK because they haven’t had enough snowy winters historically to need them) and all they do to keep roads open is to spread “grit”; a sand and salt mix. Which they don’t spare for teensy side-roads like mine. The good news is that the temp has stayed up in the last 24 hours and things are melting. I might be able to drive by about Tuesday!! Once I regain my wheels and the weather gets back to more normal, I should be able to get out and about again on some more day trips. Cheeeeeers (and burrrrrrrr!) from England!